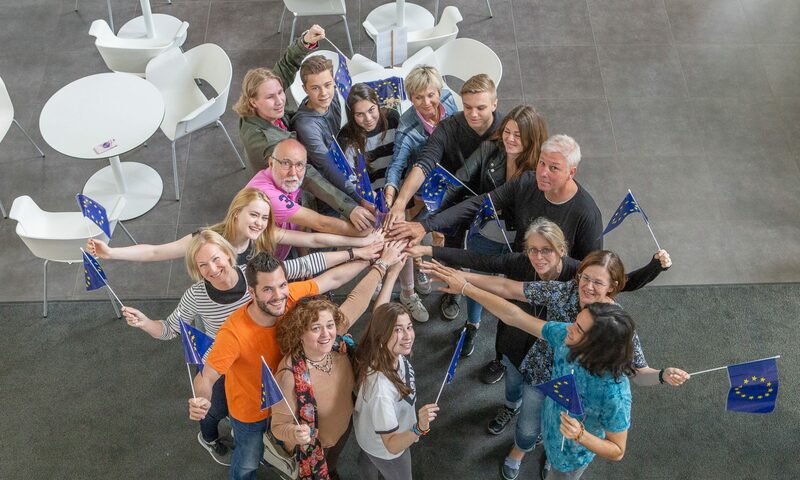 While the first transnational meeting took place in Helsinki, Finland, the second one was hosted by the Bischöfliche Gymnasium in Graz, Austria. This time the focus was on the impact of sports and exercise on physical and mental well-being. The programme of the week was manifold: On the one hand, it consisted of lectures, presentations and workshops at school in the mornings, on the other hand, students had the chance to try out various sports and compete against each other in the afternoons. A third emphasis was on getting to know some aspects of Austrian culture. Every morning the programme started with a substantial breakfast of students and teachers. Monday morning’s breakfast was followed by a brief introduction into the history and structure of our school and a warm welcome to all guests by our principal Ms. Renate Höck, and the CEO of Augustinum, Mr. Peter Jirak. Afterwards one group of Austrian students provided an overview of the Austrian school system, which sparked a brief discussion on differences between the education systems of our countries. This was followed by a viewing of the “Our city/Our school” videos, that had already been prepared for the first meeting in Helsinki, but might not have been seen by all participating students. Finally, our guests were given a tour through the school, the whole building and the school grounds in order to familiarize everybody with the surroundings they would find themselves in this week. You have just arrived at your host family’s home and they want you to introduce yourself. They will ask you some questions about yourself, which you will have to answer. Use the words and phrases you have just learned. Each group of guests was, of course, supported by their Austrian cronies. Finally, they could revise some everyday words and phrases in a Kahoot Quiz. The last point on this first morning was a presentation by some students on “Austrian History”. Naturally, only the most fundamental happenings and eras could be mentioned. Unfortunately, parts of the project were hampered by massive rain which forced us to change some activities, e.g. on the first day, the intention had originally been for one group to try out golfing. This, however, was not possible so they worked out at the gym instead. On Tuesday morning all countries first presented their results of the sports survey, which they had carried out at their schools, before heading on to interesting and partly hilarious presentations of the typical/favourite/unique sports of each country. This was followed by an “Amazing Race” through Graz with “Actionbound”, an app on our mobiles. Unfortunately, it was still pouring so we were all pretty soaked by the time we got back to school. After lunch we returned to the city centre for a visit to the town hall and a reception by the mayor of Graz, followed by a buffet of delicious sandwiches and drinks. Wednesday started with a highly sophisticated lecture by Prof. Peter Hofmann from the Department of Sport Science at the University of Graz, entitled “Sports, exercise, physical activity and health”. Students learned about the effects of exercise on aging, arteriosclerosis and the musculo-skeletal system, on osteoporosis and even mental health. Many of us had to admit that until then we had been largely oblivious to the plethora of positive effects that physical exercise exerts on the human body and mind. That exercising together can be a whole lot of fun became obvious in our next activity: a dancing class in a dancing school, where we learned the waltz and the polka, two typically Austrian dances. Hesitant, shy efforts at the beginning were soon followed by vivacious and joyful hopping and spinning, which will surely stick in our memories for quite a while. The next and last programme of the day was yet another sports event: the different countries competed in three games: handball, volleyball and basketball. Even though the rules practised in the different countries might be slightly different, one thing seems to be universal: Everybody wants to win. All teams fought really hard and at times emotions ran high, but, fortunately, nobody was seriously hurt. In the evening some students visited a shisha bar called Beyti, and caught a scent of the Balkans and of the students’ nightlife in Graz. Originally, the plan for Thursday had been to visit the Dachstein, the highest mountain in Styria, and to do some hiking there – hiking being one of the most popular sports in Austria. However, the weather was again changeable and unfavourable for going up to nearly 3000 metres, so we visited the Zotter chocolate factory and a thermal bath instead. The Zotter chocolate factory at Riegersburg may well produce one of the best chocolates in the world, so it was, of course, a must to taste all kinds of delicious chocolate. Apart from that, we were allowed to view the manufacturing process and received an interesting introduction into organic cocoa growth in South America and sustainable chocolate production. One of the highlights of this week was the visit to a thermal bath, called Loipersdorf. Hot springs have always been an attraction since Roman times, not only for their healing properties, but simply as places to enjoy complete relaxation. The participants of the Erasmus + project thus experienced a favourite Austrian pastime and had a lot of fun as well. What was left for us to do on Friday was to write glossaries on sports words and phrases. Afterwards we took a final walk through the town centre and visited a typical local farmers’ market. After lunch the victorious teams of the “Amazing race” and the sports competitions received their certificates and prizes and some final words were spoken to conclude the programme. The last evening, of course, was devoted to party at a local club called Motion. It was an evening with open end, a lot of fun and party, for many until dawn. On Saturday, it was time to say good-bye to Graz, to an exciting week and to new-found friends. We believe that all participants profited from this week, one way or the other. We hope that you all enjoyed this week as much as we did and we look forward to our own stay in another country within the framework of the project, our next meeting taking place in Valencia this November.